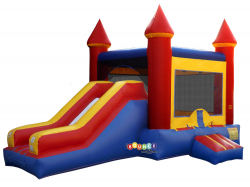 This module style 2in1 inflatable slide and bounce house is a wonderful choice for outdoor gatherings This model offers a spacious bouncer area with a side-mounted slide that is accessed from inside the bounce house by a short ladder/ramp. The slide has high inflatable sides to keep young ones in place as they use the slide. The peaked roof of the moonwalk offers extra headroom, and mesh openings allow parents to keep an eye on the children inside.